The United Nations’ Sustainable Development Goals are an ambitious set of objectives for the overall prosperity of the planet and everyone who lives on it. It’s a collaborative and intentional effort to improve quality of life and the health of the global environment by 2030. The UN is an organization of world leaders that work toward a more peaceful, sustainably developed world. In 2013, those leaders renewed their commitments towards eradicating poverty, reducing child mortality, and improving maternal health, among other efforts; these commitments are called the Millennium Development Goals (MDGs). In 2015, the Sustainable Development Goals (SDG) were designed to build on this forward-thinking plan and complete what the United Nations did not accomplish with the MDGs. In its totality, the SDGs are 17 goals, initiated by a global organization, for the betterment of the world. “We are determined to take the bold and transformative steps which are urgently needed to shift the world onto a sustainable and resilient path. As we embark on this collective journey, we pledge that no one will be left behind,” the UN said. The Goals recognize that extreme poverty is the world’s greatest problem, and eliminating it is necessary for long-term development. Other efforts in the initiative include the following: establishing inclusive and quality education, ending hunger, achieving gender equality, conserving oceans, and building resilient infrastructure, among others. There are three goals that recognize the great need for water access, sanitation, and hygiene (WASH) and their foundational role in improving life for the rural poor. There are 844 million people (11%) globally who do not have access to at least a basic level of safe water; most of those people live in rural places that are difficult to reach. And, eradicating poverty starts with access to safe water. When people have safe water, waterborne diseases decrease, and families no longer have to pay for health clinic fees. Children, who aren’t spending their time walking long distances for safe water or ill from waterborne diseases, can go to school. Families have more money to invest in their futures, and children have an education; it all starts with water. While providing safe water improves health and helps people prosper, health is not maintainable without intentional hygiene and sanitation practices. Without healthy habits, water is likely to become contaminated, thereby tainting a foundational necessity and returning families to the same hardships they experienced before they had safe water. Women, the elderly, and the disabled are especially positioned to experience the most challenges in developing countries; with its promise of “for all at all ages,” the UN identifies the most vulnerable and vows to take steps to improve their quality of life. It’s vital that the wheels continue to turn after aid leaves developing countries. This goal acknowledges that sustainability only happens when stakeholders and local communities participate in their own advancement. And at a national level, there must be standards and administration to manage water resources. This is all to ensure that every person, no matter their social status or financial condition, receives access to clean water and improved health. Clean water, sanitation, and hygiene are the most critical factors in measuring health and well-being. Gete, for example, is one of many mothers who has experienced extreme poverty in Ethiopia. But, once she received safe water and learned simple ways to improve her and her family’s health, she found that less waterborne illness in her household meant more time to work as a farmer and less money spent on health clinic fees. Real people with families and ambitions are experiencing the water crisis now, and the impact that safe water and healthy habits have on their daily lives is immense. 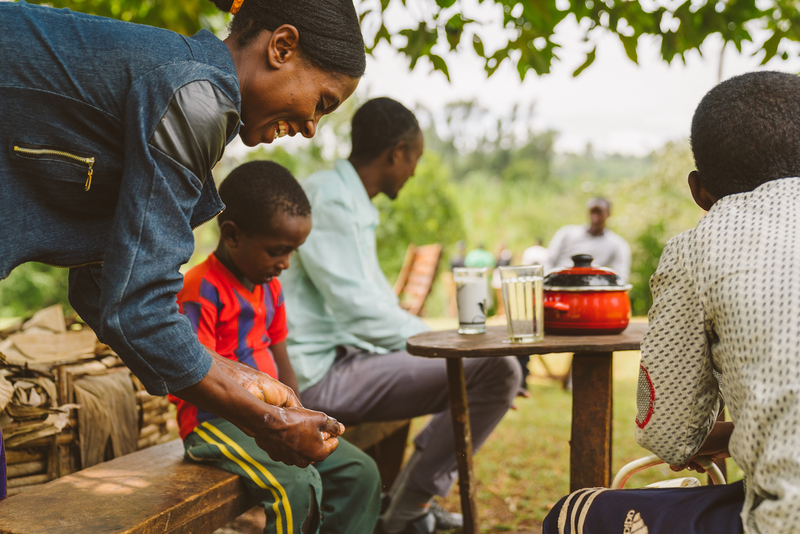 Gete’s safe water and healthy habits are improving the health of her children, meaning less time and money spent on health clinics, and more time to thrive together.